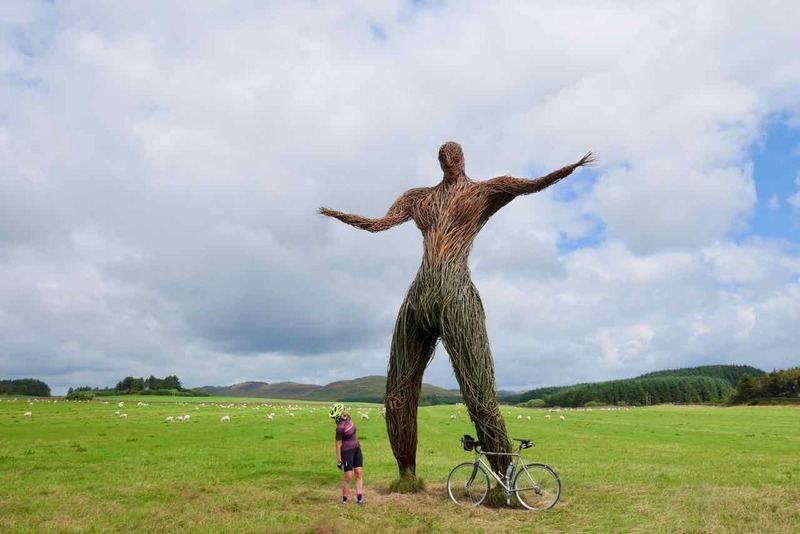 Welcome to Dumfries and Galloway and this intriguing bike tour in South West Scotland. Welcome to a thousand miles of quiet roads and the backdrop for countless poems, novels, rebellion, and wars. Welcome to one of the most beautiful countries in the world as voted by Rough Guide. Scotland has always and will always be a magical destination. Perhaps it is because the history is almost palpable, ever present, and spoken of often. Or perhaps it is the incredible landscapes, the rolling hills, and lush farmland. Here, you will find people that still take the time to stop and wave. 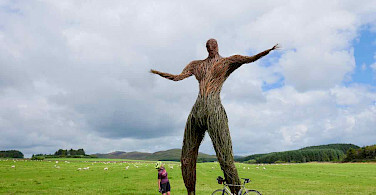 We offer other bike tours in Scotland of course! Exta night in Thornhill: please ask! You can fly into/out of Edinburgh (EDI), Glasgow (GLA), or Manchester (MAN). You will take the tram or bus into Edinburgh center. Both the tram and the bus leave from inside the airport. From Edinburgh Central train station (Waverly), there is a train service to Manchester Airport that stops at Lockerbie. We will be there to meet you and transfer you to your first accomodation..
You will follow the signs at the airport to the train station which is in the same complex. Train to Lockerbie (direction to Glasgow Central or Edinburgh). Where you will be met and transfer to your first accomodation - this is included in your tou. From Glasgow Airport you will take a bus to Glasgow Central and then a train to Lockerbie (Transpennine service to Manchester Airport) or Dumfries (Scotrail service to Carlisle). From here, you will be met and transfer to your first accommodation. Please check local conditions before your departure. A good website to explore average high/low temperatures, average rainfall, and more weather related facts is www.weatherbase.com. Summers are pleasant here with long days and short nights (sunset can be as late as 10pm) with daytime temperatures in July typically reaching 66° F/19°C. 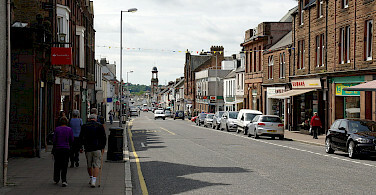 Kirkcudbright has high sunshine totals, with 1425 hours of sunshine recorded in a typical year. Average high/low temperatures in degrees F for the region are: May, 57/44°, June, 61/49°, July, 64/53°, August, 64/53°, September, 60/50°, and October, 54/46°. Fly to London and take the overnight bus up to Dumfries (National Express : http://www.nationalexpress.com/home.aspx). This service goes directly to Castle Douglas, your first accommodation. We will provide a hotel list on request. 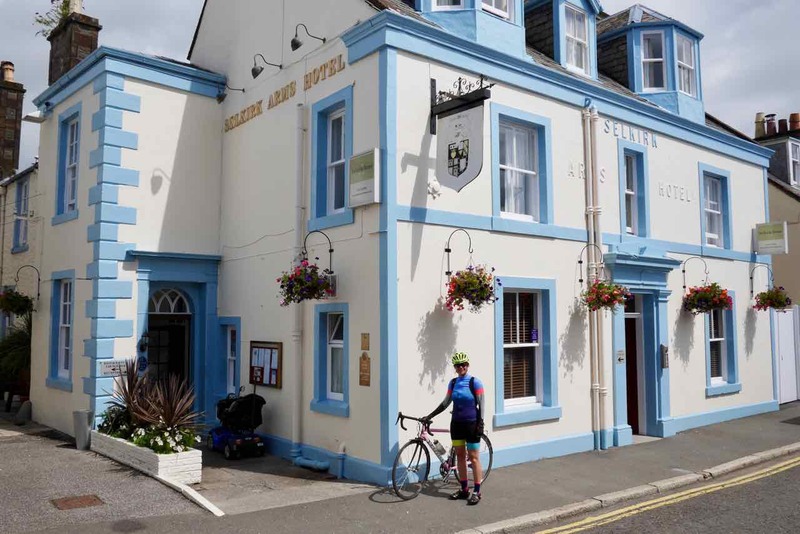 Based on availability, you will generally be staying in the Douglas House B & B in Castle Douglas, the Selkirk Arms Hotel in Kirkcudbright, the Cruachen B&B in New Galloway, and the Buccleuch and Queensberry Hotel in Thornhill. Tickets and entry fees for tourist attractions, castles, gardens, etc. Arrival possible on any day! Best time to enjoy a cycling vacation here would be May through mid October. This is an easy to moderate tour. 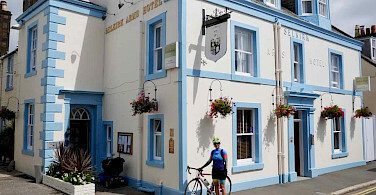 Upon arrival, there is an included transfer from Lockerbie, the famous border town, to your first night's accommodation, a B&B in Castle Douglas. The bikes will be ready and waiting so feel free to take a ride. If you have time, you can visit Threave Castle , located on an island in the middle of the Dee River, accessible by boat, a very romantic experience. You may just fancy a spin around town and visit the award winning micro brewery. 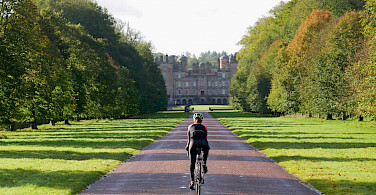 The route leads to the Scottish Riviera along the River Urr on the National Cycle Route 7 to Haugh of Urr. 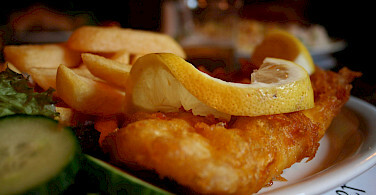 The Laurie Arms (opens at 12 pm) is in the village. 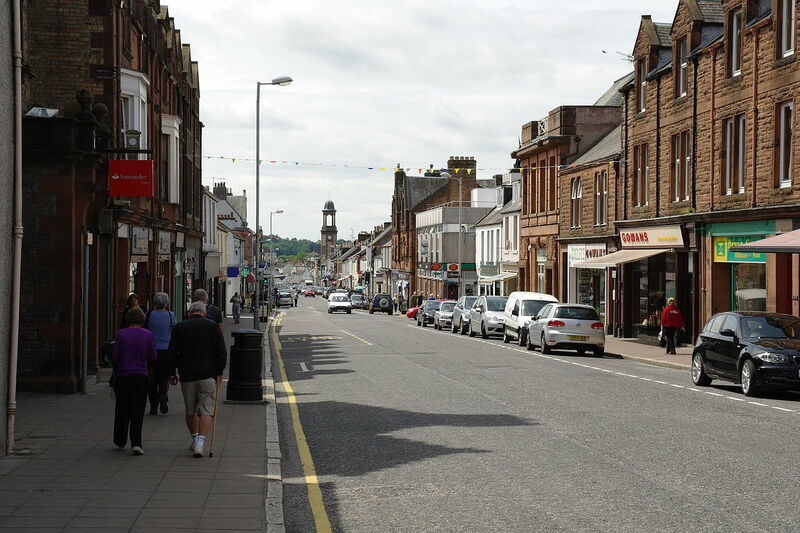 Then you head for the coast through Dalbeattie. There is a free museum full of eccentric charm. You will reach the coast at Sandyhills and it is suggested to drop into Kippford for a pub meal, or a visit to "the Ark" for coffee and cake. You can continue through the forest, off-road for the next bit with panoramic views over the bay. 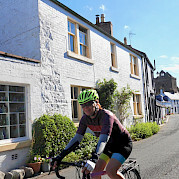 Return by quiet roads to Castle Douglas and a brewery visit or coffee and cake. 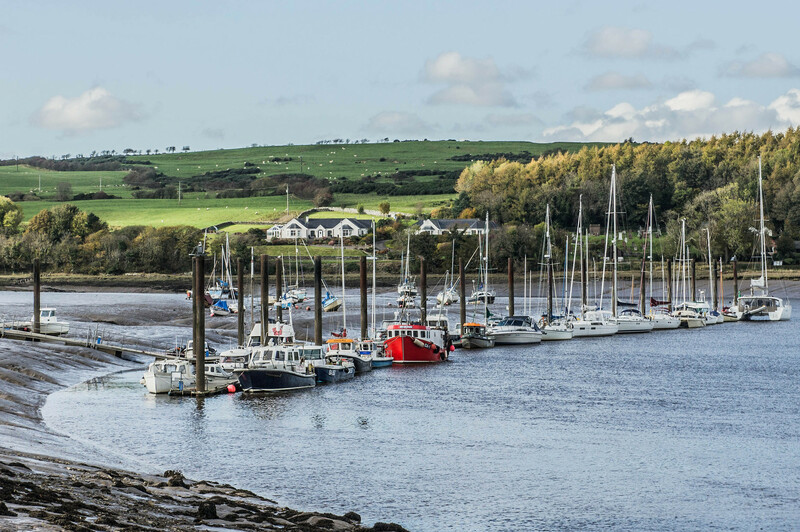 Today's journey is along the Solway coast with pretty fishing villages and breathtaking views of the coast line. On the horizon across the Firth, you will see the mountains of the English Lake District. There is coffee and cake and the ruins of Dundrennan Abbey to explore. 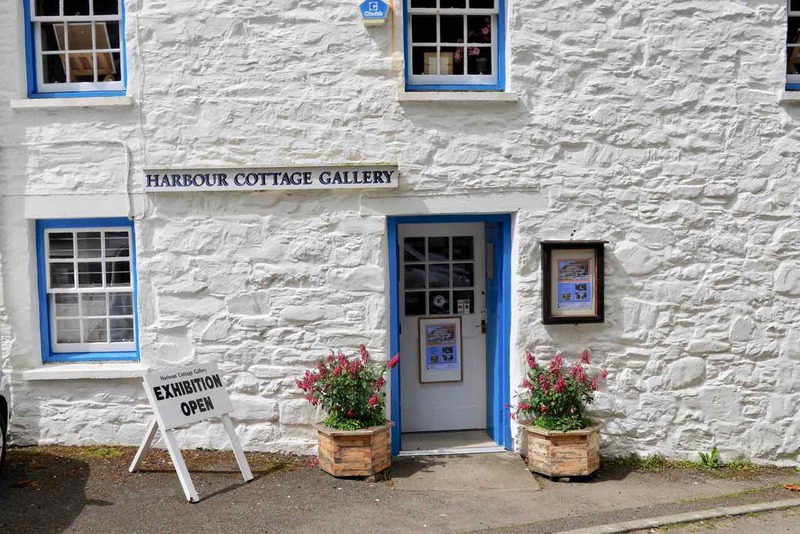 The Artists' town of Kirkcudbright with its pastel colored houses, castle, art galleries and museums are your destination today and will be sure to enchant. 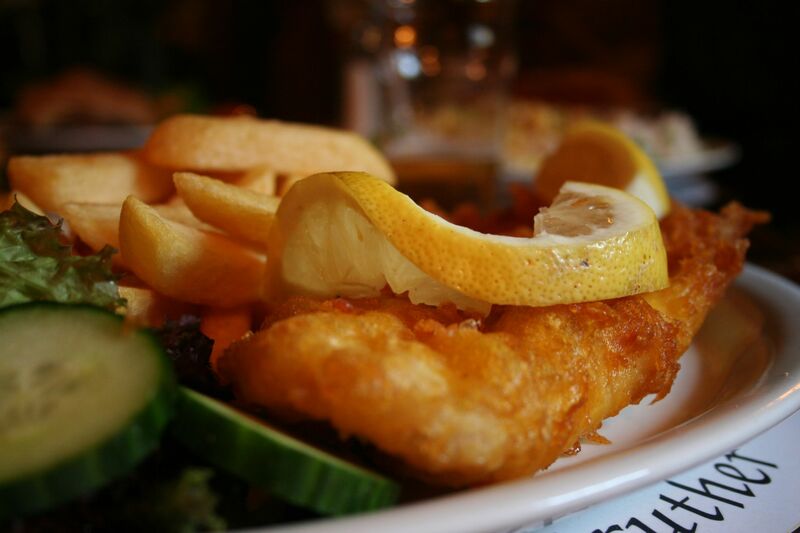 It has a working harbor and the best Fish & Chips in Galloway. You will have a short ride today plus a walk, to add some variety. The highlight is a visit to High Banks cup and ring rock art, which may be at least 3,000 years old. It is worth it to do a bit of research before you visit! Did you know these markings are a form of prehistoric art yet these markings are found through out the world! Many theories have been offered as to their purpose, including rituals, or marking of the stars, but nobody knows for sure. 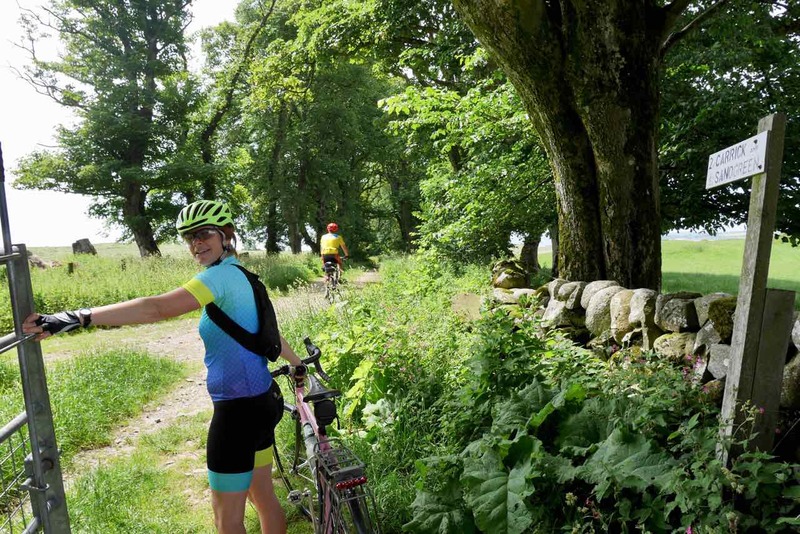 After this fascinating stop, you ride to the coast beside the Balmae Burn. There are more cup and ring stones along the route before you return to Kirkcudbright. You have just managed to learn how to spell and pronounce Kirkcudbright and now you are on your way again. You follow a path along the River Dee, passing the abandoned wooden fishing boats subject of thousands of photos. This is one of the best views of Kirkcudbright and you can see why so many artists come here. Twynholm could be your first stop at the chocolate factory for coffee and cake before you head for the coast and the village of Borgue. The coast beyond is full of history and curiosities. Pirates, smugglers and Viking harbors and the extravagant castle shaped dairy known as Cow Palace. Some of the most beautiful beaches in Scotland are dotted along this stretch of coast. The route goes off road to visit some of them before passing through the grounds of Cally Palace where afternoon tea is served or you could wait until your first pass through Gatehouse. Refreshed, you have a loop around one of the most beautiful quiet valleys as you ride along both banks of the Water of Fleet. Look out for some of the most beautiful old Beech trees in the area and Rusko Castle as you cross Castramont bridge to return to Gatehouse. 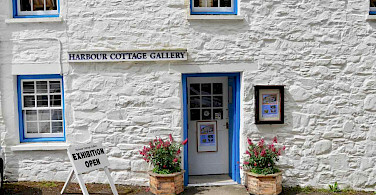 There are gallery's, second-hand and antique shops, and of course more cafes to visit. Many local people have strong views on which is their favorite valley and you begin today by riding through one of them. 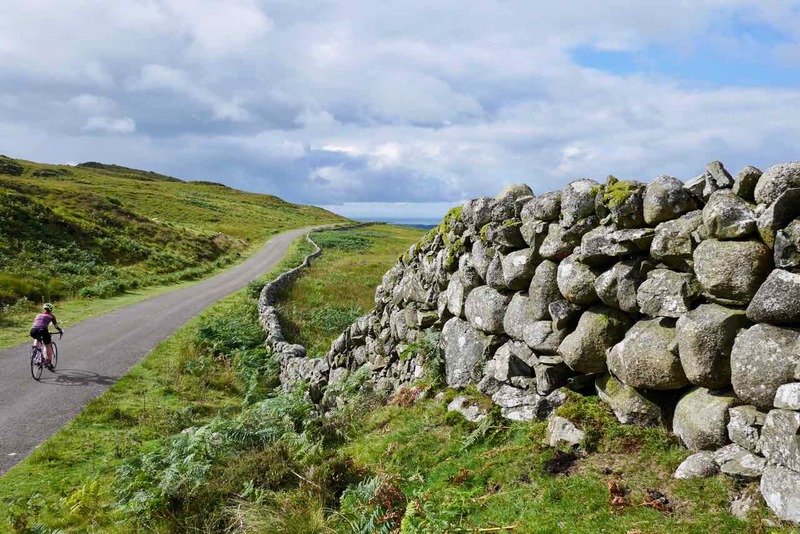 It is a short day, with fantastic views back to the coast as you climb into the uplands. Enjoy the most perfect of downhill runs into Lauriston and the photography gallery. There are two ways to go now. Either a longer route to Ken-Dee nature reserve or the more direct route to Loch Ken. Either way, you will have Scotland's most iconic bird flying above you, the Red Kite. 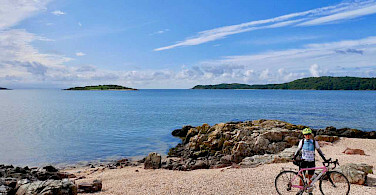 Todays ride is about water; rivers, lochs and waterfalls and the Galloway Forest. 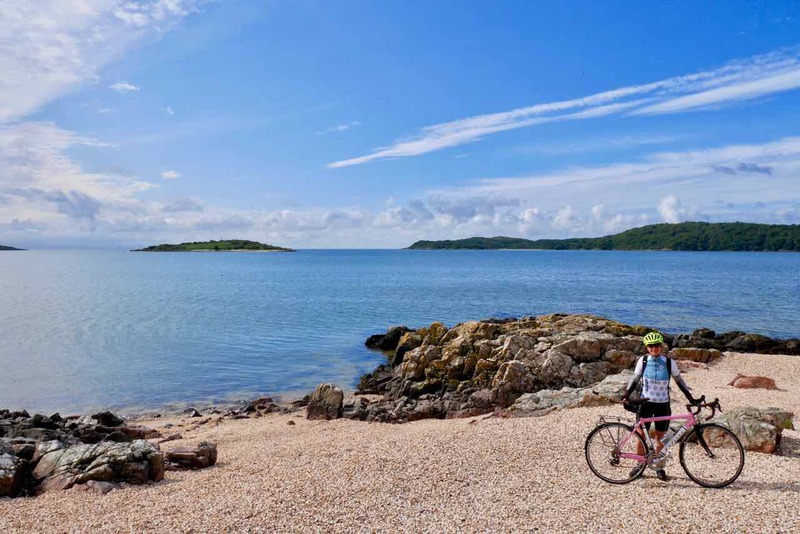 You ride along the Water of Ken to New Galloway and into The Glenkens hills. There are two tea rooms in New Galloway, both fantastic If you are lucky it may be a night for music at the Catstrand, which should not be missed. 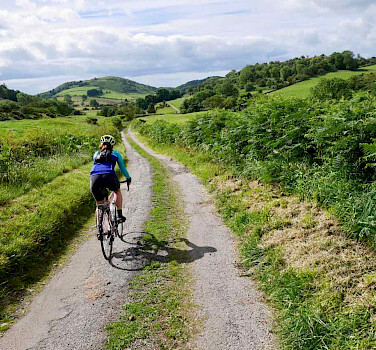 A day of remote and breathtaking cycling on the quietest roads you will ever bike with a long off-road forest section. An easy start, out along the Water of Ken before you turn into the uplands. This has a feel of the Highlands, with snow on distant peaks until late Spring. Along the Queens Way watching for wild goats and Red Deer. Clatteringshaws visitor centre ( 10-4 ) for coffee and cake and views over the loch, before taking to the forest trail. 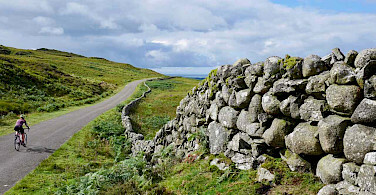 - The Raiders Road takes you through the forest to return to Loch Ken and the road back to New Galloway. 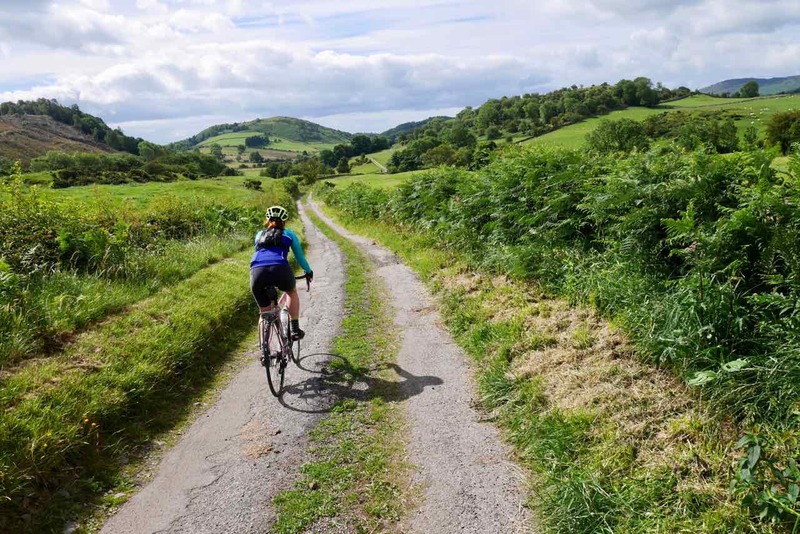 Today's ride takes you further into the rolling hills and wide horizons of the Galloway Highlands. A more remote and wilder feeling of big skies and sheep. You pass through Moniaive, the ‘Festival Village '. It may be a folk festival, theatre performance or horse show and there is often music in the bar. There is a great cafe with tempting cakes too. As you leave the village there is the only major climb of the tour, take your time to look around, there are Bronze Age forts on the hill tops. You drop down and into the village of Penpont. Another tea room and nearby is the workshop of Kirkpatrick Macmillan the inventor of the modern bicycle. 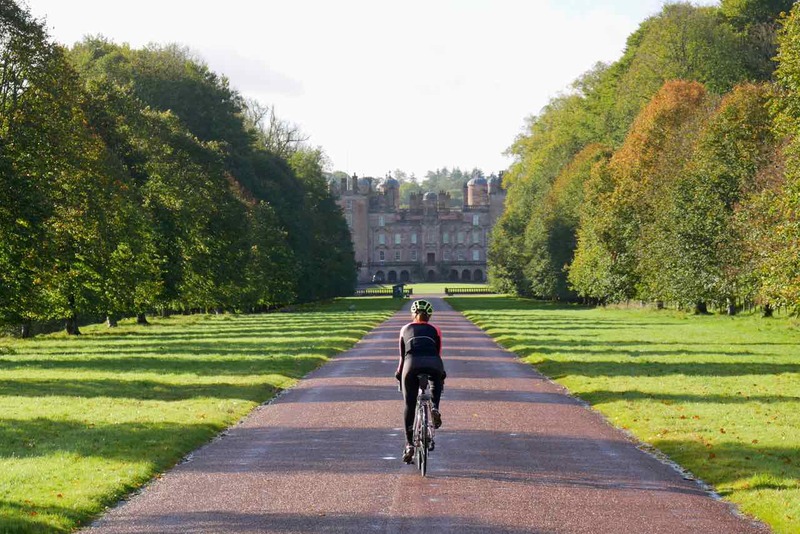 Drumlanrig Castle, as featured in the TV series "Outlander", is one of Britain's grandest castles, and today you get to ride through the grounds. Look out for some of the biggest trees in Scotland along the banks of the River Nith. There is a great tea room in what was the kitchen of the castle. 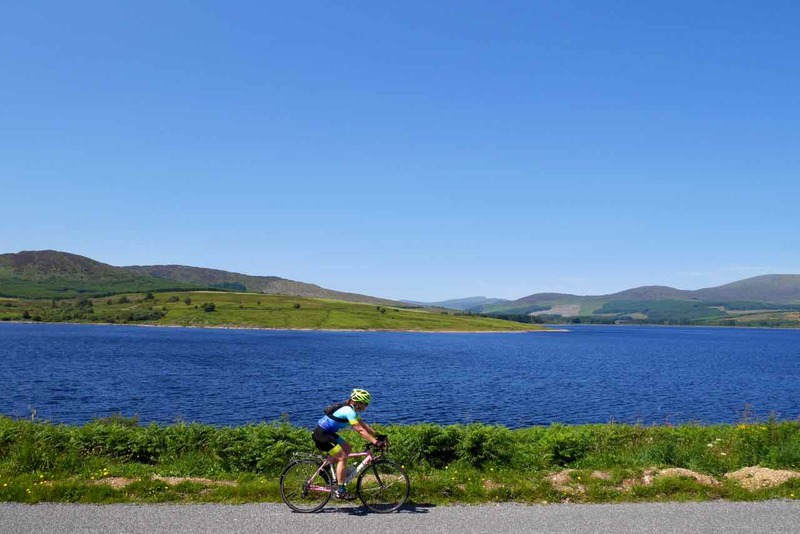 You ride out along quiet roads and get your first panoramic views of the Galloway Highlands. Descending to the village of Penpont there is another tea room, and just outside the village the workshop and grave of Kirkpatrick Macmillan, the inventor of the bicycle. A short way now back to Thornhill for your final night. You have the option to stay longer, but if you can't, you will be driven you back to Lockerbie/Dumfries. If time permits, you can stop off at the Twelve Apostles Stone circle - the largest stone circle in mainland Scotland. 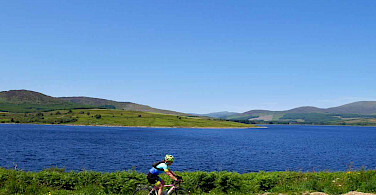 This tour is run by Galloway Cycling Holidays.